Here are 10 of my favorite everyday salad dressing recipes. They’re perfect for tossing with all sorts of salads, and also double as easy sauces for dipping or drizzling. After sharing dozens and dozens of salad recipes with you over the years, I thought it would be fun to do something different today and share the 10 salad dressing recipes that have become my go-to favorites over the years. You know, those tried-and-true dressings that I’ve made zillions of times and know by heart and can whip up in a snap. As you can see, this collection covers a pretty wide range of cuisines and flavor profiles. So I think there should be something here for just about any salad you might be craving. And — bonus! — I realized after taking this photo that each of these dressings also happen to be naturally gluten-free. Mostly, though, I love each of these recipes because they don’t include any of those pesky additives in many store-bought dressings, they’re all totally quick and easy to make, and they’re all totally delicious. Pomegranate Vinaigrette: First up is this simple pomegranate vinaigrette. I know that raspberry vinaigrettes are traditionally more popular, but to save the step of pureeing fresh (or frozen) berries, I’ve come to love this simpler tangy fruity vinaigrette that’s made with a quick pour of pomegranate juice instead. Feel free to sweeten it up a bit more if you’d like (I prefer mine pretty tangy). 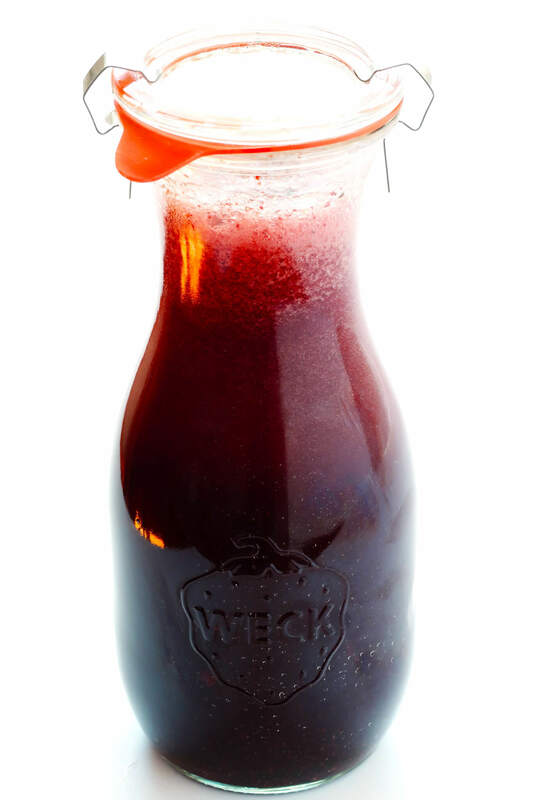 And if you don’t have pom juice on hand, cranberry juice also works well as a substitute. Italian Red Wine Vinaigrette: As evidenced by so many of the salad recipes here on this blog, this classic vinaigrette is probably the #1 dressing that I use in my kitchen. 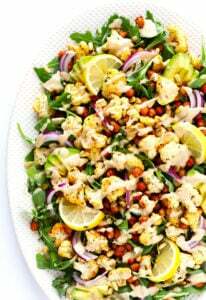 It’s quick and easy to make, easy to customize for different flavor profiles, and it has a way of magically complimenting just about any salad. 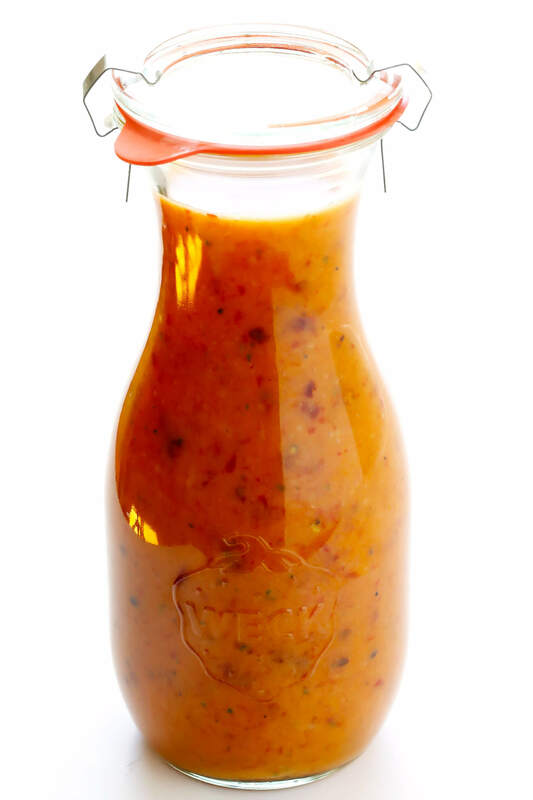 Chipotle Honey Dressing: Inspired by the famous dressing at the burrito chain itself, this yummy dressing is packed with all kinds of savory and tangy and slightly-smoky flavors that will compliment just about any Mexican-themed salad. Ginger Carrot Dressing: Barclay and I have a tradition of going out for sushi every Monday night. And after having ordered a side salad with this ginger carrot dressing at least 100 times, I finally decided it was time to learn how to make it myself last year. So for anyone else who loves this Japanese favorite, you’ve gotta try it! 4-Ingredient Honey Mustard Dressing: Did you know that all you need are 4 basic ingredients to make this classic dressing? (Or honey mustard sauce, if you want a dipper?) There are all sorts of extra ways you can customize it, but the base recipe is super simple. 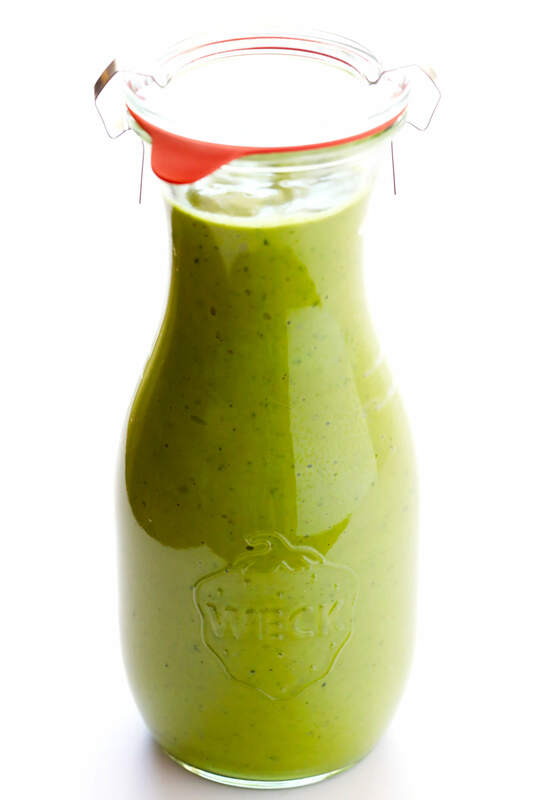 Avocado Cilantro Dressing: Or, as I like to call it, “guacamole dressing”. This easy creamy dressing is basically my excuse to have a little guac with my salad. Although if you’d like to give it a more all-purpose flavor profile, it also tastes delicious using fresh parsley + lemon juice instead of cilantro + lime juice. 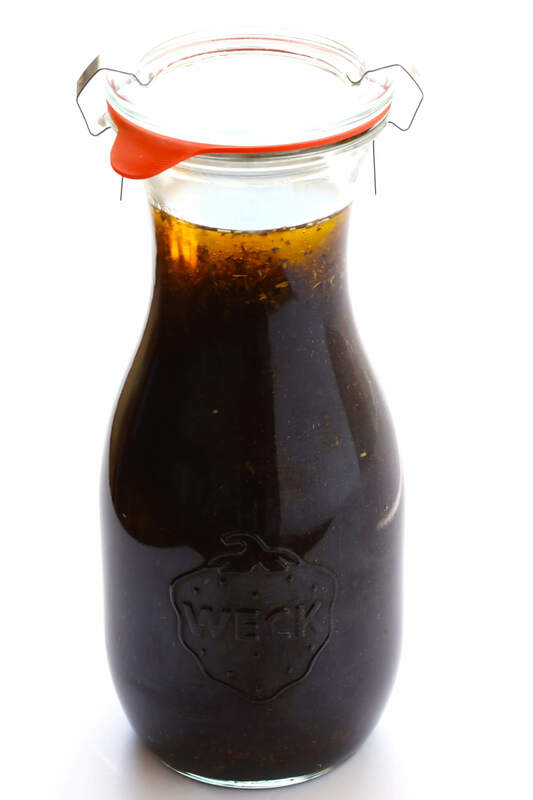 Maple Balsamic Vinaigrette: Every salad lover needs a good balsamic vinaigrette recipe in their back pocket, and this is my go-to favorite. It’s slightly sweetened with maple syrup instead of sugar, made with extra amounts of tangy balsamic, and always hits the spot. 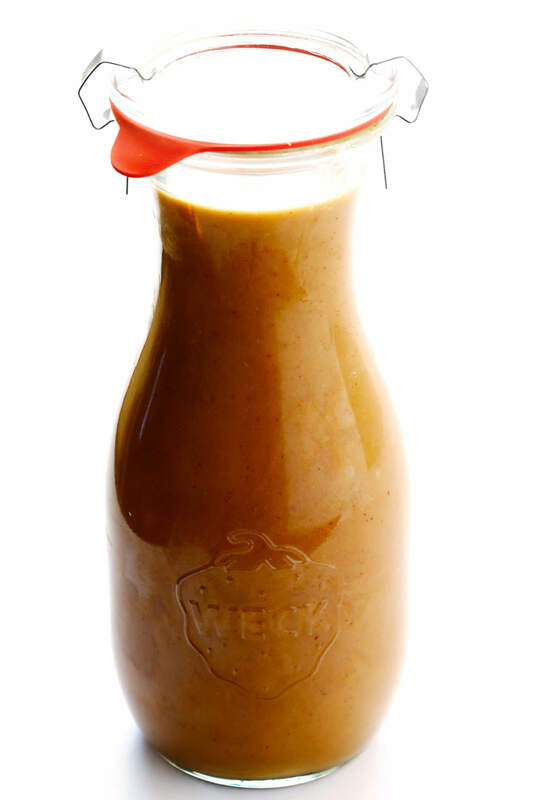 Thai Peanut Dressing: I’ve improvised all sorts of peanut dressings over the years, some more spicy, some more sesame-y, some more lime-y, etc. etc. But when I want a well-balanced Thai peanut dressing, this recipe is my favorite. 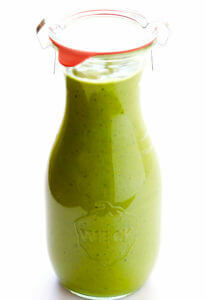 It’s easy to make in the blender or food processor, although you can also just whisk it by hand if you’d like. 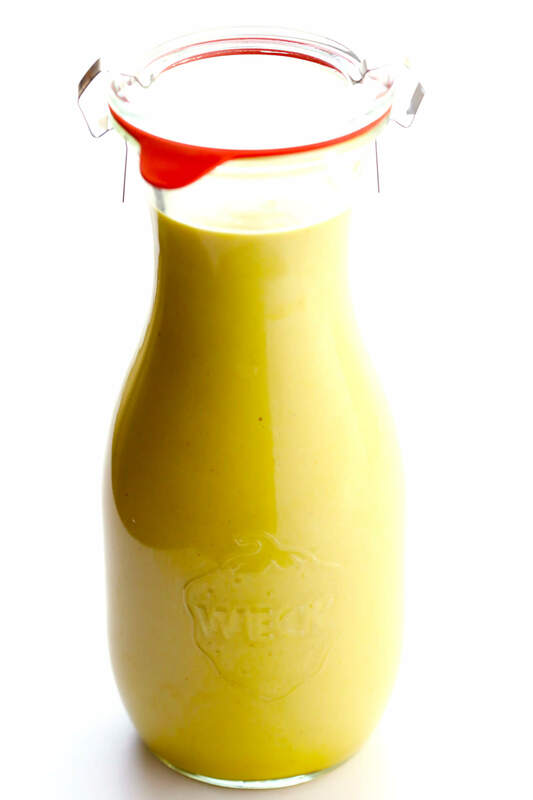 Dreamy Tahini Dressing: I’ve been a fan of lemon-tahini dressings ever since I first tried and the magical kale salad dressing at The Westside Local in Kansas City years ago. I’ve played around with random variations of this dressing over the years, but really, you can never go wrong with this base recipe. 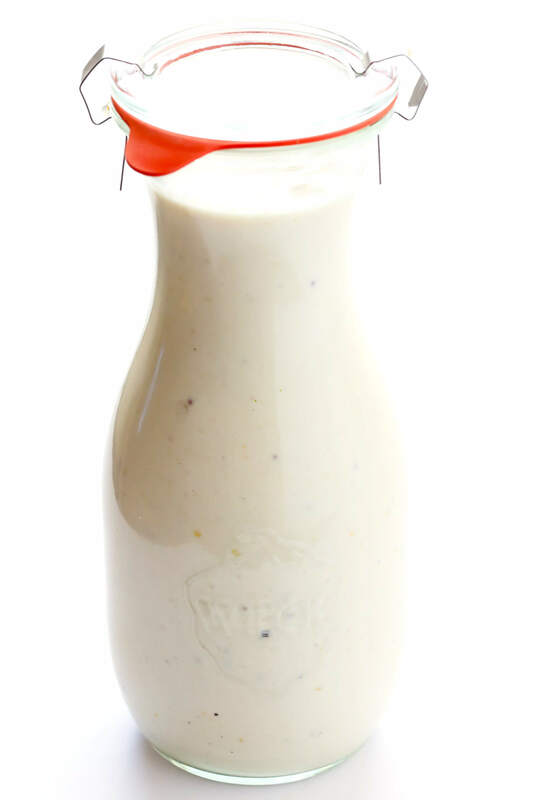 Greek Yogurt Caesar Dressing: This recipe has been on the blog for a few years now, and always gets great reviews. It’s rich and creamy and everything you love about a good Caesar…just lightened up with Greek yogurt instead of mayo. Always a win. This post is amazing!! 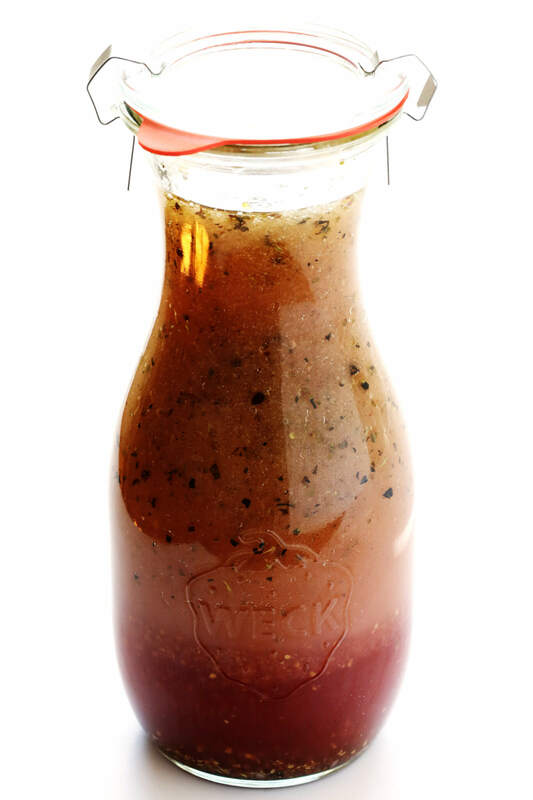 I’m always looking for good homemade salad dressing recipes, because my own homemade balsamic vinaigrette can become a bit of a snooze. I’m anxious to try the Thai Peanut and the Dreamy Tahini first!…all of these dressings look so tasty! I love this post! My favorite is a miso dressing, but it’s pretty intense for some people, so I usually make a vinaigrette when serving guests. I will love having this as a reference. And I LOVE that salad at the Westside Local! Jen Yu at Use Real Butter has a delicious kale salad with a maple tahini dressing…not the same recipe, but absolutely delicious too. Westside Local FTW! And oooh, would love to hear more about your miso dressing. I’ll have to check out Jen’s tahini dressing too! Thank you for this post!!! So helpful! Yay, glad to hear it! Sorry, we currently don’t provide nutrition info here, but you’re welcome to plug the ingredients into My Fitness Pal — http://www.myfitnesspal.com/recipe/calculator. Hope that helps! Thank you for this post…I’ve wanted some good dressing ideas and know I’m not going to go wrong if I use one of these. I am eyeing the maple balsamic but the red wine Italian sounds tasty too. Awesome, hope you enjoy them!! :) Those are two of my faves! Cannot wait to try the Maple Balsamic and the Italian Red Wine! I’m always looking for tasty homemade salad dressings, so I’m excited to give these a try! YUM!!! Thanks for sharing. I’m having trouble trying to pin the top photo so that I have all the flavors listed. The individual ones will pin, but not the photo with all of them listed. Thanks for any help you can provide. hey Ali, nice post. Please keep sharing your ideas. I eat salads almost every day for lunch. And it’s hard to get excited by the same thing. But these dressings will help. Thanks! The Italian Red Wine Vinaigrette sounds like it’ll be a new staple in my house! The Maple Balsamic sounds so versatile and tasty. I’ll definitely give it a try! Oooh, a little extra citrus sounds delicious! Maple Balsamic is my favorite but these all look fantastic! I noticed that these are photographed in canning jars. Did you can them? I just used those little jars for photographing and storing them in the fridge. :) Unfortunately, I know very little about canning. Someday I need to learn! I was looking for a good salad dressing and here I find 10 great ones. Thank you so much!! Yay, hope you enjoy them! I love this post…saving immediately. Alli – does the Thai Peanut compare to Lulu’s Thai Peanut Sauce that they serve with their Spring Rolls? We moved from KC about a year ago and we cannot find anything like it / them! We use your drunken noodle recipe ALL the time, but if i could figure out their Spring Rolls and Peanut Sauce, I would be so happy! Let me know your thoughts! And thank you again for all of your inspiration! do you have a recipe for Russian dressing? This is EXACTLY what I need – I’m heading off to school in a week, and am planning to pack salads for my lunches. Such a great variety of salad dressing to choose from here! Thank you so much for sharing! thank you for all of these, love having so many scratch dressing recipes in the “pantry”! Super excited to try these! How long do they typically stay good in the refrigerator? Do you have something like 10 favorite seasonings? If not, can you, please? With suggestions on how to use them? I am trying to have an arsenal of “go-to” staples to make meal prep easier! Your tahini dressing is my favorite! Can’t wait to try the others. 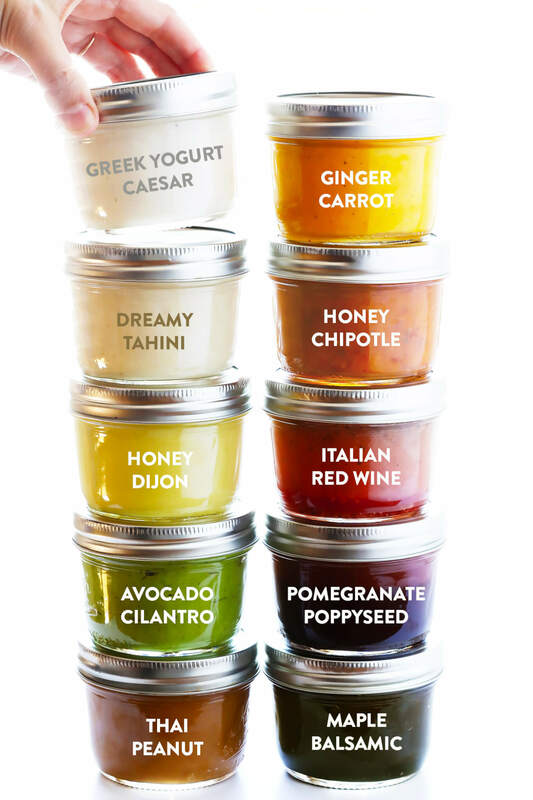 These are amazing – definitely making dressings homemade is something I need to do. How long do they last once made? Thanks!